These peculiar critters are a strange, yet delectable, treat for many forest dwellers. 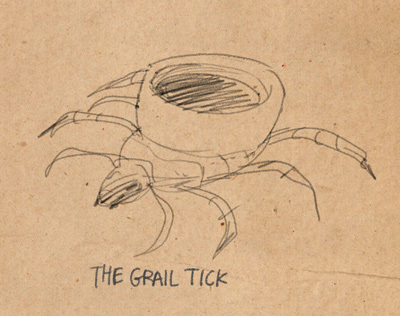 Grail Ticks are shaped like tiny cups and secrete a mucus that naturally fills the cups. The mucus is a kind of viscous, delicious nectar that sloshes around on the Grail Tick’s back, providing a sweet and nourishing snack to woodlanders savvy enough to enjoy. It has been said that should one be hungry, a sip from a Grail Tick is sustenance enough to add twenty five miles to a journey. In fact, a famed world traveler, Jestuf Meerlo once catalogued the exact distance he was able to traverse on a diet of Grail Tick juice. His logs indicated that with no more than twenty five ticks secured in his purse, he marched 626 miles. One mile better than the average and without food, water, or sleep. Meerlo’s triumphant accomplishment sparked a trend of swigging Grail Ticks to boost one’s athletic performance. Hundreds of adventurers flocked to the forest floors, plucking up the ticks and swigging their juices. But no one was able to reproduce Meerlo’s results! Later, Meerlo reported on a short tour of the Middle-Kingdoms that he had, in fact, intended to double his record and walk a keen 1250 miles. However, his stunt was cut brutally short by a wave of adventurers refuting his Grail Tick claims. In the end, Meerlo was forced to admit his fabrication, thus ending the trend and ruining his chance at any sort of meaningful place in history.